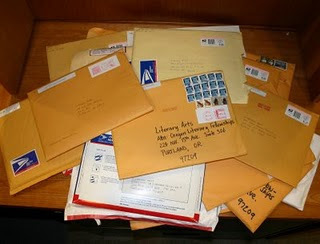 The deadline to apply for an Oregon Literary Fellowship is June 24, 2011, two weeks from today. Applications are due in our office by 5:00 p.m. that day. There is no charge to apply for an Oregon literary fellowship. If you are a writer living in Oregon, you are eligible to apply. Fellowships will be awarded in the amount of $2500. Independent publishers are also eligible for fellowships. You do not need to be a published writer to receive a fellowship. Here’s a link to a page that answers some frequently asked questions about the fellowships. I write young adult literature. What category should I submit it in? If you write young adult literature, you would submit it in young readers literature. What are the judges looking for in a fellowship application? Our judges change every year. The fellowships are merit based, not project based. What that means is that the fellowship is awarded based on the quality of the work submitted, rather than a description of what you will spend the money on. Yes. It should be submitted in manuscript format, though, rather than a photo-copy of the magazine or book it appeared in. If I spend my money on the application fee, I won’t have money left over to spend on other things I need for my writing, like paper. There’s no charge to apply! I have applied before and not received a fellowship. Fellowship recipients sometimes apply several times before receiving a fellowship. The judges change every year, so your work will be read by a different person each time you apply. I have never applied for a fellowship before and I’m not sure I know how. It’s easy to apply for a fellowship. Fill out the application, and assemble your best work. If you get stuck, call the office or email Susan Denning. It does take time to apply for a fellowship, but many writers find they learn more about themselves as writers in the process, which can be tremendously useful. If you are an Oregon writer, your name could be among those announced as fellowship recipients in January 2012. If you have questions about how to apply, email Susan Denning at susan@literary-arts.org or call the office at 503-227-2583.